← Want to start a business? Just do it !! From the time we are born, directly or indirectly the world throws at us the notion that to fail is a bad thing. When a baby fails to walk within the prescribed time, parents aren’t happy and are often heard saying “My child has still failed to walk.” When you start nursery school studies and can’t quickly get a hang of writing numbers, reading stories or drawing and colouring, right from the teachers to the parents it’s deemed as failure and often calls for “extra lessons.” When a child fails to get the passmark that enables them join a particular school for Primary or Secondary Level Studies, parents get disappointed and deem it failure. Recently, I read in an Agony column about a parent who was beating up his child and continuously ridiculing him for failing to pass the Primary Leaving Exams with good grades thereby embarrassing the family and exposing it to ridicule. The story goes on and on. Such negative talk and experiences with failure builds an impression in our lives that ‘you either make it or make it.‘ The demonisation of failure has had the effect of stopping many dead in their tracks hence not fulfilling their potential. When Select Garments, a company that was known for selling Gents suits over the years experienced a setback and had to close shop, people lurched out at the proprietor and overnight we had all these wannabe business analysts dissecting his weaknesses and convincing us why he could never have been a successful businessman. Never mind that his tormentors have hardly run vegetable kiosks. In 1985 Steve Jobs was ousted from Apple, a company he founded by its Board of Directors and the CEO, John Sculley that he had personally hired. This wasn’t the best of time for him as he was just 30 years old and already a public celebrity. In a commencement speech at Stanford University he said “What had been the focus of my entire adult life was gone, and it was devastating… I was a very public failure.” This led him into an early mid-life crisis. Years later, in 1997, he was called back to a nearly bankrupt Apple which he later realised was 90 days away from bankruptcy by the time he took over. In the same year, when Michael Dell was asked what he would do if he were in Steve Jobs’ shoes, he responded, “What would I do? I’d shut it down and give the money back to the shareholders.” By the end of 2006, Apple’s worth had surpassed that of Dell and we all know that the rest is history. Back home, in an interview with one of the local daily newspapers, Steven Kiprotich the current World and Olympics Marathon Champion was ridiculed as a failure when he quit studies to concentrate on athletics. A quick Google search is enough show you that his decision isn’t regrettable. A friend of mine I studied with has toyed around with various entrepreneurial ventures over the past decade. His story is quite humbling. Full of what I will opt to call challenges and not failure. He set up a forex bureau with a team of friends and quickly realised the need to have controls in order to avoid financial leakages. When he came up with an implementation plan and shared it, he was hounded out. He then tried his hands on a transport business which quickly became successful and at its peak, monthly revenues of Ushs 40 Million were a common sight. Due to lack of proper controls, this dwindled down to as low as Ushs 4 Million and he was forced to sell off the business for peanuts. Being the hardliner that he is, he simultaneously tried his hands at setting up a hostel residence for students. To cut the long story short, this too failed miserably after he had invested handsome proceeds into it. Despite the knockouts he had experienced, he never gave up and went ahead to found a Human Resource Consulting firm which he has wrestled from a time when partners had offered to buy him out to the current stage where its a leading player in the recruitment industry and has branches all over East Africa. These stories and probably many more that you already know all point to the fact that failure or challenges are not a death sentence. No successful entrepreneur can claim not to have a scar of failure up their sleeves. I speak to many of you out there whose fear of ridicule has prevented you from realising your full potential. Bill Cosby once said, “In order to succeed, your desire for success should be greater than your fear of failure.” “The person who risks nothing, does nothing, has nothing, is nothing and becomes nothing,” a quote from Leo Buscaglia. While success may steer you forward, failure catapults you even further. Failure is to success what rocket fuel is to a rocket. 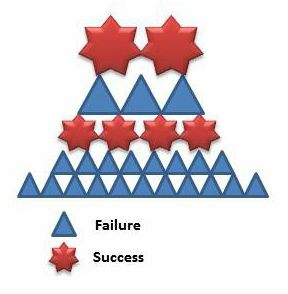 Managing failure, learning from it and building upon it is very key in our lives. All said and done, what the average Joe views as failure, real entrepreneurs view as a challenge or setback. “Success is stumbling from failure to failure with no loss of enthusiasm” once said Winston Churchill. You have feared for too long, years have gone by, you may have seen one idea after another that you had in mind become a runaway success for others that chose to implement amidst all the risks. This is the time to change the scales, let the desire for success prove to be more potent than your inherent afinity to fear. Get off your laurels. The time is now !!! This entry was posted in Business and tagged africa, business, entrepreneurship, failure, James Wire, school, small business, sme, success. Bookmark the permalink. Thanks for this James Wire. You write so well and make it so simple for anyone to follow. I guess all your blogs on entrepreneurship are meant for me. This particular one is so powerful because I noticed that right from home to school, we dwell on weakness. Giving students positions at school makes them compete on the basis of weakness emphasising that one is more intelligent than the other which is not always the case. I think we need to start dwelling on strengths. Look at Indians? They have mastered the art and now their strong points on business. They dwell on that and pass it on from Gen to Gen.